Lübeck is a city in Germany located in the state of Schleswig-Holstein. The old town center (Altstadt) has maintained the medieval appearance with old buildings and narrow streets. In the past the city could only be accessed through four gates, two of them, the Burgtor and Holstentor still exist. The Holstentor is a symbol of Lübeck and one of the main attractions. The Petrikirche was built between 1227 – 1250 and enlarged in the 15th and 16th centuries. During World War II the roof of the church was destroyed. The reconstruction was completed in 1987. The Petrikirche is no longer used as a church but rather as a vibrant center for events and exhibitions. From its observation deck visitors can enjoy a magnificent view of the city. The Lübecker Rathaus is one of the most beautiful town halls in Germany. The Marienkirche is the third largest church in Germany. Numerous works of art can be found inside the Marienkirche. The Lübeck Cathedral is one of the oldest monuments in the city. During World War II it was partially destroyed by air strikes. The reconstruction of the church took several decades and was completed in 1982. The Aegidien is the smallest of the 5 main churches in the historic center of Lübeck. It is decorated with Gothic wall paintings and elements from the Baroque period and the Renaissance period. The Buddenbrookhaus is dedicated to Thomas Mann and the novel “Buddenbrooks“, published in 1901 when he was 26 years old. The second publication in 1903 “Buddenbrooks” became a great literary success and led Mann to a Nobel Prize in Literature in 1929. Taking a tour and exploring the alleys and courtyards of the old town of Lübeck is like going back to the Middle Ages. The Niederegger Café is located in front of the City Hall. In the hall of the “marzipan” you will be able to discover how this delicacy of Lübeck is made. The St Jakobi was built in 1334 and suffered no damage during World War II. A lifeboat is dedicated to the wreck of the boat “Pamir” in 1957. It is located in the north tower of the chapel. The Burgkloster is the most significant medieval monastery in northern Germany. 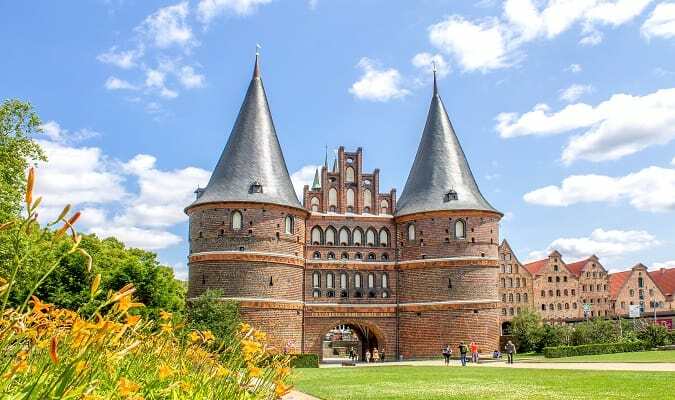 The Radisson Blu Lübeck is located 4 minutes from the Holstentor. The Hotel H+ Lübeck is a 4-star hotel located near the Central Station. The hotel has 96 modern rooms equipped with a flat-screen TV, safe. The Haerder Center Lübeck is located at the intersection of the main shopping streets of Breite Strasse, Holstenstrasse and Königstrasse. Brands: Essanelle, Fexcom, New Yorker, Pandora. Lübeck has easy train access from various cities in Germany. Famous cities nearby: Hamburg, Schwerin, Bremen, Kiel.